Sandal season is upon us, and I’ve been trying to avoid the temptation of wearing comfy flip-flops every day. After meeting Sam Edelman and hearing him talk about gladiator sandals (specifically about how people once told him gladiator sandals would never take off in the U.S. because of “cankles”), I was desperate to try some myself. While running errands in Target a few weeks ago, a pair of gold gladiator sandals from the Sam & Libby line (Sam Edelman and his wife’s Target collection) caught my eye. I remembered Sam telling us that gold was going to be important for this season. Target was running a buy one, get one half-off sale that day, so I actually bought two pairs– gold and black. Since then, they’ve been my favorite shoes for casual outings and evening events alike. Even though I usually don’t stray far from neutrals, with black being my go-to color, I love the formal touch that the gold gladiators add to ensembles. They make a great statement and the elegant metallic balances out the bold silhouette of the shoe. 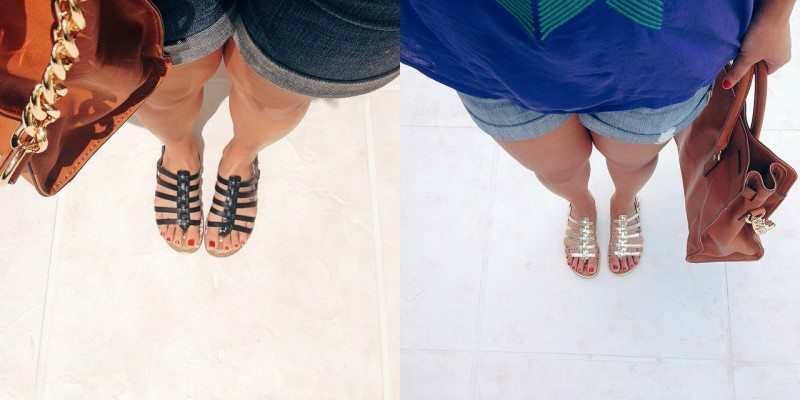 Here are some of my favorite gold gladiator sandals at every price point! Would you add any of these to your shoe collection? Ugh now I want some! So cute!